Does BikeCad support any type of Recumbent building? No, BikeCAD does not currently support any sort of recumbent design. 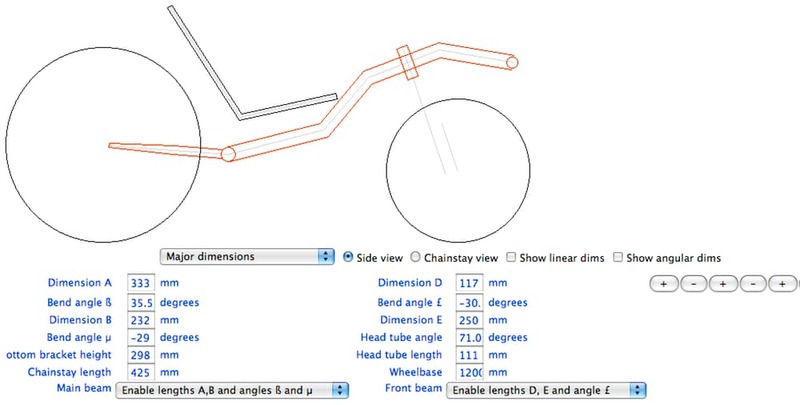 Having said that, some BikeCAD users have exhibited incredible creativity in designing non-diamond frame bikes, despite the fact that BikeCAD is only intended for diamond frame geometry. Here's an example. Hi Brent: I had found (about 2008 i think), free online recumbent geometry setup.... and I thought it was yours? If you do a quick search for bikecad on google and read the GizMag link, you'll find the below image of what I had used years ago. Does that look familiar? Was that you or someone you know? (if so, is it still available to us? Also... any chance I can still you bikecad on OSX 10.6? as, I cannot run java 1.8.... Maybe you have an earlier online version available for us Canadian's lacking newer computers.... Regards, Rob from Southern Okanagan. Yes, I developed this years ago but have not updated it since. It is still available at bikeforest.com/CAD/recumbentCAD.html. Be aware that most people will need to add www.bikeforest.com to their Java Exception Site List as described at: java.com/en/download/faq/exception_sitelist.xml. In your case, since you are running an earlier version of Java, I don't think you should need to add anything to your Exception Site List. (I believe this extra hoop was only added in Java 1.7) This should apply to your use of the free version of BikeCAD as well. It was in an effort to accommodate folks such as yourself that I did not compile the code on Java 1.8. Instead, I compiled it on Java 1.5. I expect to compile future versions on 1.6.
thanks greatly for the info, and IT info - Hope to work on a recumbent design soon. An MTB injury has taken me off upright bikes, and after a little weight gain and "financial" depression - I really NEED to ride (roll) again. Depending on when you started at Syncros - I had the first bar ends & stems they every made !